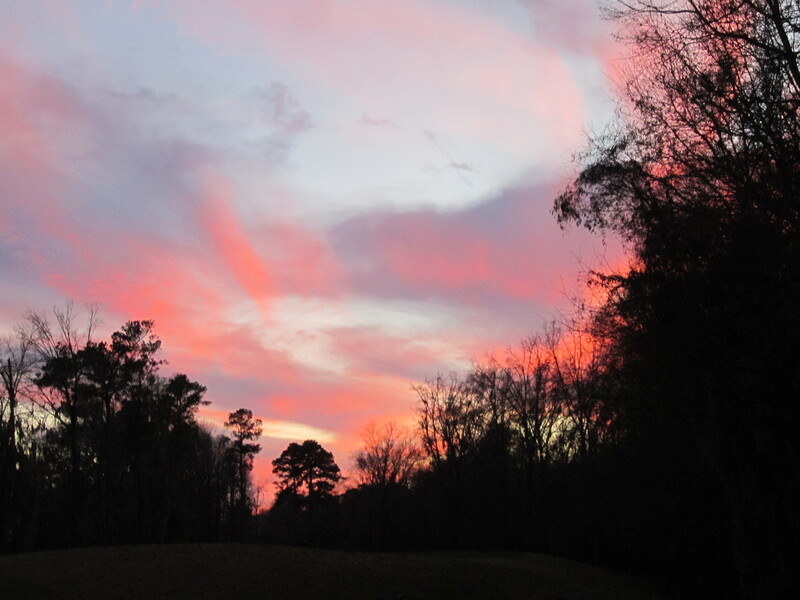 Prattville Alabama, Just The Usual Historical, Haunted and Paranormal Southern Golf Town. I love when I am driving along and fate chooses me to take a closer look at something really interesting. Such was the case when I was playing “100 Dishes To Eat In Alabama Before You Die.” I checked out a restaurant called Jim’s Place, which ranked due to home style Southern cooking. Jim’s did not rock my world, but led me to barbecue nirvana at Fat Boy’s Bar-B-Que (see two prior blogs). I had fun here. 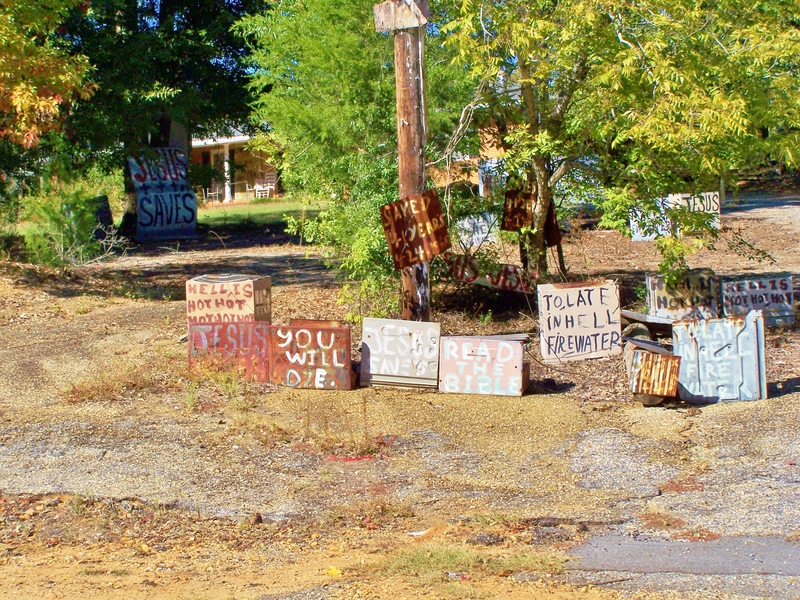 So bear with me as I travel “near.” I saw Prattville Alabama the Meg way. 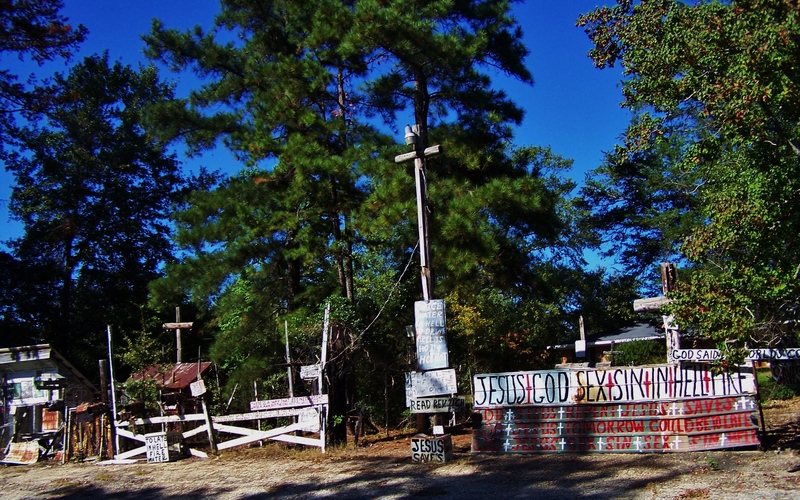 Aside from being owned in a game of golf, I found some off the beaten path and freaky places; A haunted factory and swamp, a curious cross garden, a well that holds healing powers. the Robert Trent Jones Trail. This course is on the radar of worldly golfers and wins many “bests.” It get’s nods from the likes of The N.Y. Times and was named the number two public golf site in the country by Golf World readers. This little attraction has hosted the Navistar LPGA and this past week, Alice Cooper so that’s cool. Three complete 18 hole championship golf courses. The Senator is a Scottish links style course. The Legislator is traditional and plays along a scenic bluff and dips into a beautiful SWAMP. The third course is The Judge, which has views along the winding Alabama River. The first tee has a spectacular view of both the river, the Montgomery skyline and on the first hole, a sign which dares you, “Prepare To Be Judged.” SNAP! Difficult, beautiful, public and at a reasonable price, this lil place brings in over 100,000 people per year. It’s impressive. If you golf, put it on your damn list. Fat Boy’s Bar-B-Que is near the historic downtown. There is a short trail along the Autaugua Creek with great seating and picnic areas. On the quiet day that I was there, there was outdoor action;picnickers, fly fishing, bikers and walkers. A canoe/kayak map is available on the trail along with some of the key historic points. 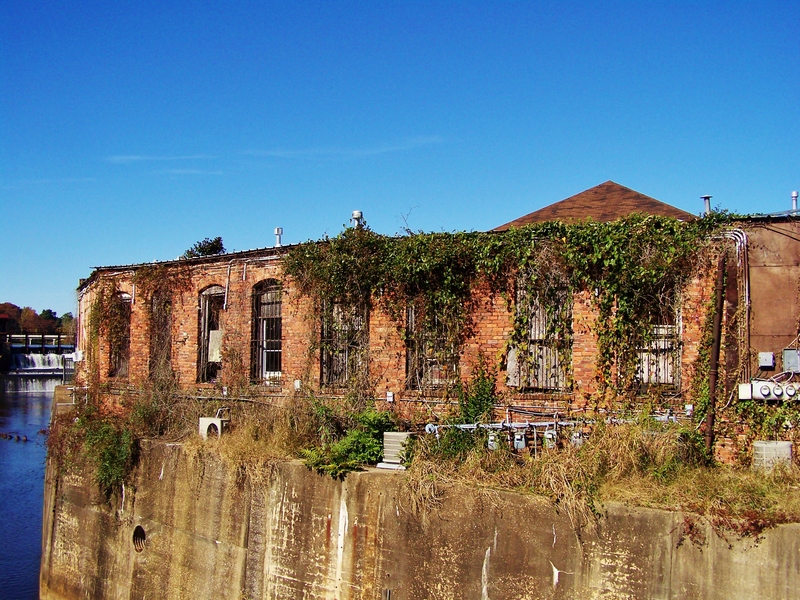 It brings you into downtown with an awesome view of an old brick complex which was home to the First Industry in Alabama. Revitalization is happening. Myself, I saw a lot of great buildings just waiting to be used in creative ways. The place reminds me a bit of the paper mill industry where I grew up. In the spirit of revitalization, an old mill was turned into hip condos with a restaurant overlooking a dam and river. A museum with the history of paper sits adjacent to these places. People love it. I would think that model would work very well in this spot. Before I get to the weird, hang with me. The downtown is on the National Historic Register. If one is an architecture buff, there are some cool buildings in this area to see. 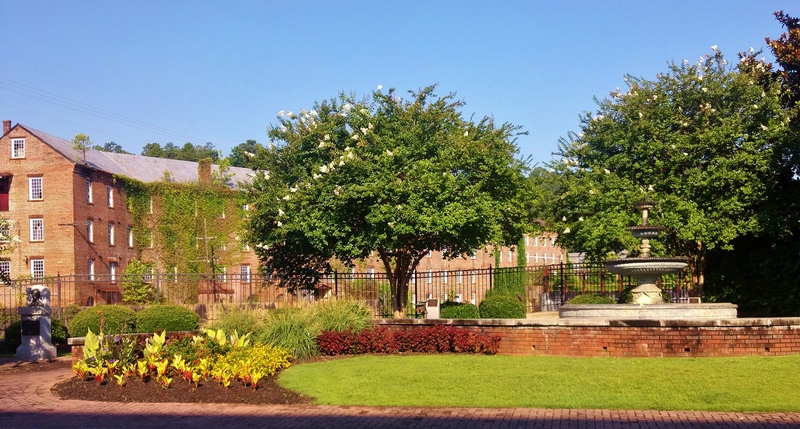 From the Southern Antebellum Mansion, Greek Revival, to the Italian style. Prattville was settled pretty early, 1833, and by a dude from New England. New England +Alabama+ industry = interesting. Myself, I enjoyed learning about cool old “shotgun houses” on Hunt’s Alley. I thought they were awesome. 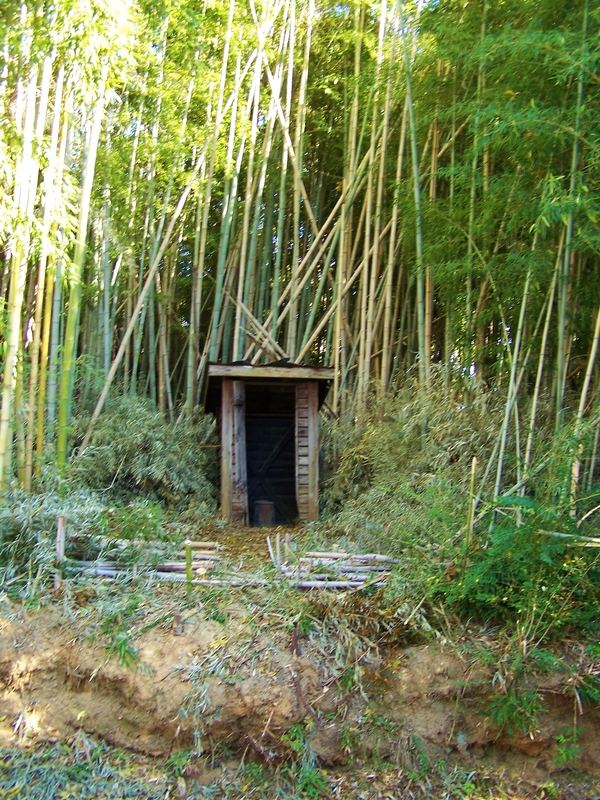 There were old outhouses out back surrounded by tall bamboo. Now is this the place to sit and think- or what? 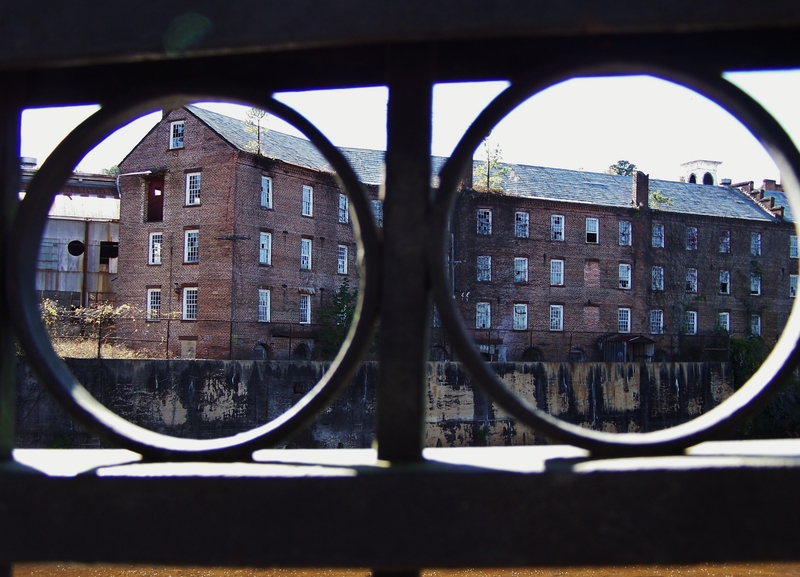 If architecture and history doesn’t make you quiver, or you are into the paranormal, there is a haunted old cotton mill in downtown Prattville. 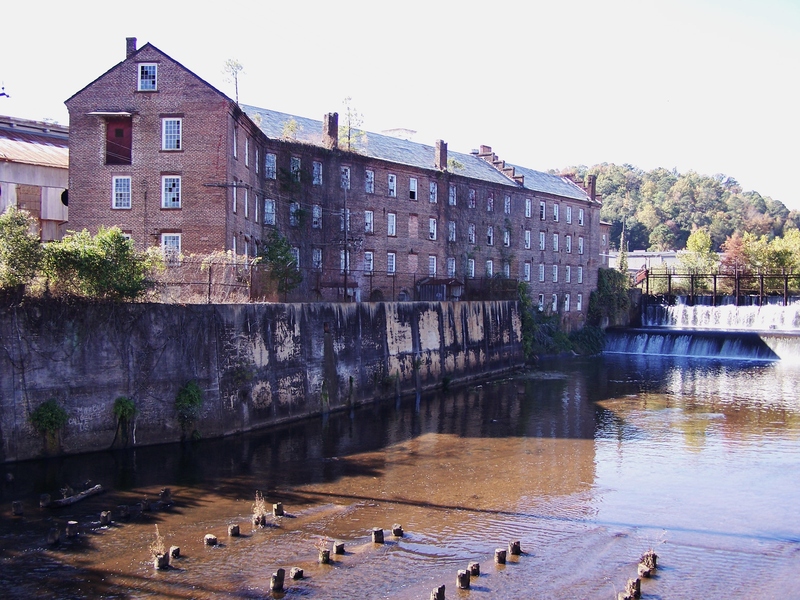 Daniel Pratt Cotton Gin Mill Company is reportedly the subject of a haunting. 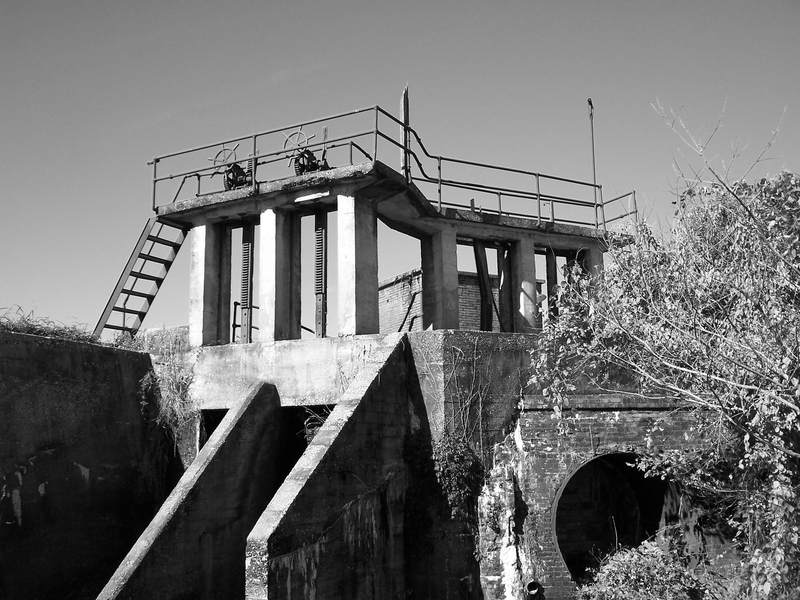 Some say it is haunted by the workers who died in the mill. Others say it is most definitely a woman, a mother, aka “The Lady in Black,” who looks for her child, Willie Youngblood. Poor lil Willie reportedly died in an elevator shaft after a fall. And his mama, who was widowed, threw herself in the creek and drowned. Apparently, now wanders there in eternity looking for her Willie. Some say the ghost of the founder Daniel Pratt walks there. SyFy channel recently visited Prattville to do a story aired on “Deep South Paranormal,” entitled “Got them Lady In Black Blues.” Now, I did not see this show but I was able to read about the episode and watch a short clip. You too can recreate this moment. All that you apparently need is to recreate the Blair Witch dolls, get in the creek on a boat with some candles, special potions, a mirror and a ghost vibe. I went during the day and the Lady in Black did not show herself. Just for fun I checked the death records and census in Alabama. I found no matches, but I did find a Drucilla Youngblood, Wana Youngblood, a Ferral Youngblood and and I-da Youngblood. I swear that I am not making that up. I am going to start a rumor with these names. *Disclaimer, if these are your relatives, no offense intended. Just for kicks, I dug through the Alabama genealogy websites and found a story of a man who was paralyzed at work, the wife treated his bedsores with acid, kid drinks the acid and dies. His name of course was Willie Youngblood. 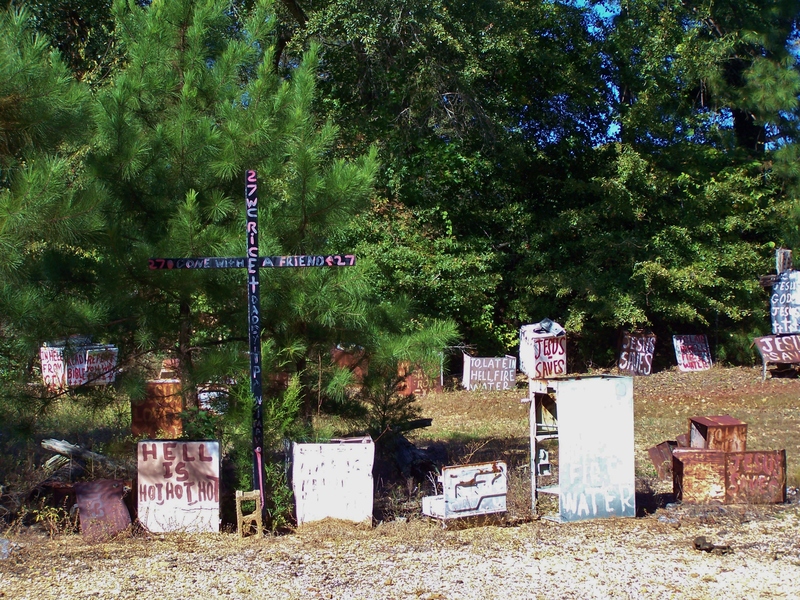 Just out of town and on the way to the swamp, I saw a cross garden that I had read about. No words needed. This scared the beejeesus out of me. Artesian Wells are the reason that Prattville is called the fountain city. To my shigrin, these now mostly capped off wells are consistently listed as an attraction. Now, I don’t know about you but looking at a drinking fountain doesn’t exactly tickle my fancy. However, I checked out this well in a haunted swamp which reportedly has magical powers. Now THAT is interesting. Apparently, this area was settled by a group of Native Americans called The Creek Indians. The Creeks were in this area until about 1814 and used this well for legendary healing properties. 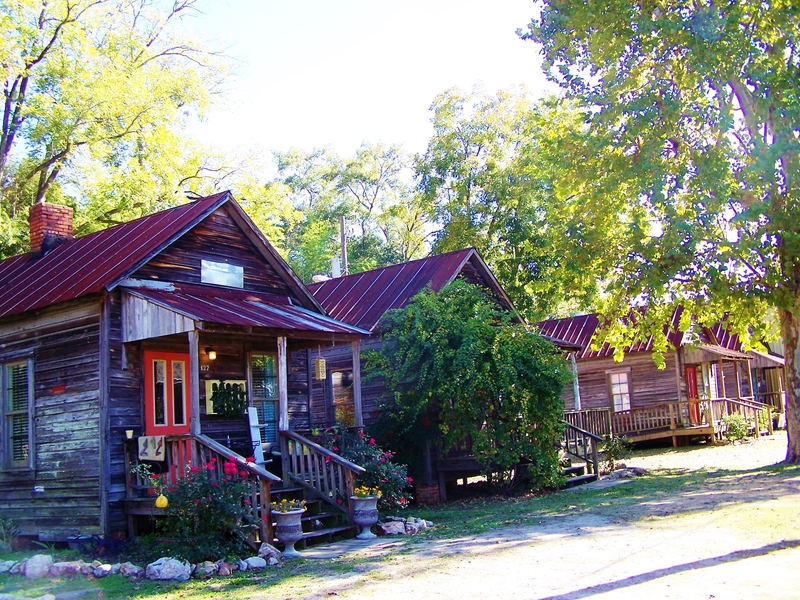 The county is named Autauga which gets its name from the creek word “Atagi” which was the word for pure water. The healing powered well, is a pipe, in a grubby swamp with water running supposedly from an artesian well, I drank from it. I actually went swamping because I had heard that there was a cat like Chupacabra, or a witch (apparently the same thing.) I had been watching too much “Finding Bigfoot.” What I did find by a quick search, was that the stories seem to be more about; little people, strange creatures, phantom lights, orbs, unusual amounts of snakes and lizards, unusual sounds, Civil War soldier ghosts, The ghost of a woman who killed those who have wronged her, Indians, settlers and soldiers. Also, the ghost of a mother looking for her child and if you are brave enough to say “we have your baby” three times, she may appear. That should cover the urban legends. It is my understanding that there were no civil war encampments, nor battles in this area. It has been suggested that perhaps soldiers from the Creek Indian War are the apparitions. The paranormal researchers seemed to zero in on the phantom lights. 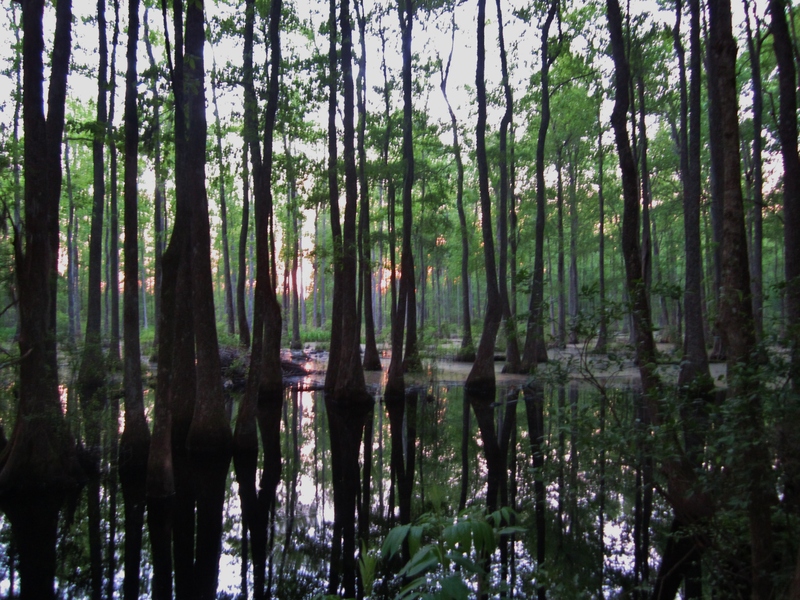 The cypress swamps are so freaky that if one had an altered state from polluted well water or whatever, I am certain that little people and cat witches could appear. Other fun killers who were with me, just thought it was a swamp, with garbage in it. I took photos in different lighting and I really grooved on the place. Now, I would not want to be out there alone, especially at night. I could totally imagine how this was a serious creep out when it was more primitive, or if you were a kid playing Bloody Mary. I give this place about 4 ****megastars. Thank you for the kind comments Penny! Meg, I’d like to get in touch with you via email to request permission to use one of your pictures. So cool! Definitely on my to see list! Hi, I want to thank you for the read and nice comment. Sorry for my delay, I am still learning! Chagrin…this makes me want to see Prattville…but shigrin isn’t a word. Thanks for writing this. The ghosty stuff is fun but the architecture is amazing! Good read!